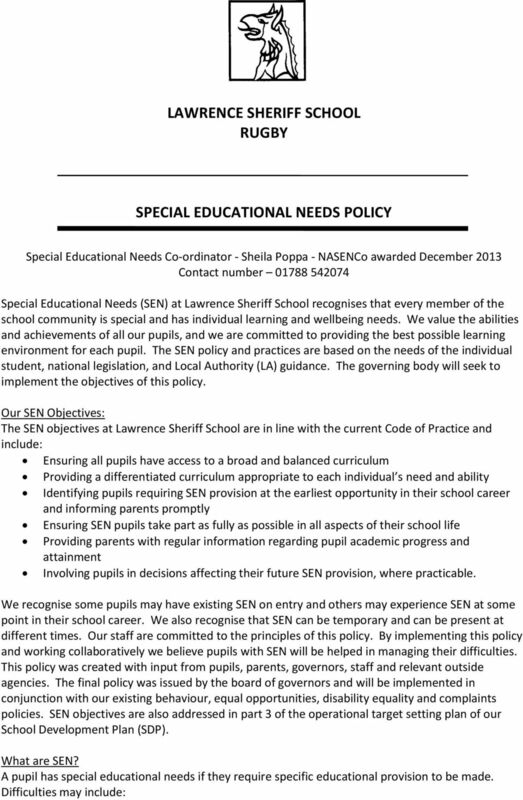 Download "LAWRENCE SHERIFF SCHOOL RUGBY SPECIAL EDUCATIONAL NEEDS POLICY"
2 o Pupils experiencing significant difficulty in learning in comparison with peers o Having a disability which prevents the pupil from accessing educational facilities o Pupils experiencing emotional difficulties which prevent them from engaging on a social or academic level. Particular care will be taken in identifying SEN where lack of progress may be attributed to any of the following: English as an Additional Language (EAL). Absences due to long term illness/hospitalisation. Frequent geographical re-location. The school and its governing body believes that the admissions criteria should not discriminate against pupils with SEN ensuring they be treated as fairly as all other applicants for admission. 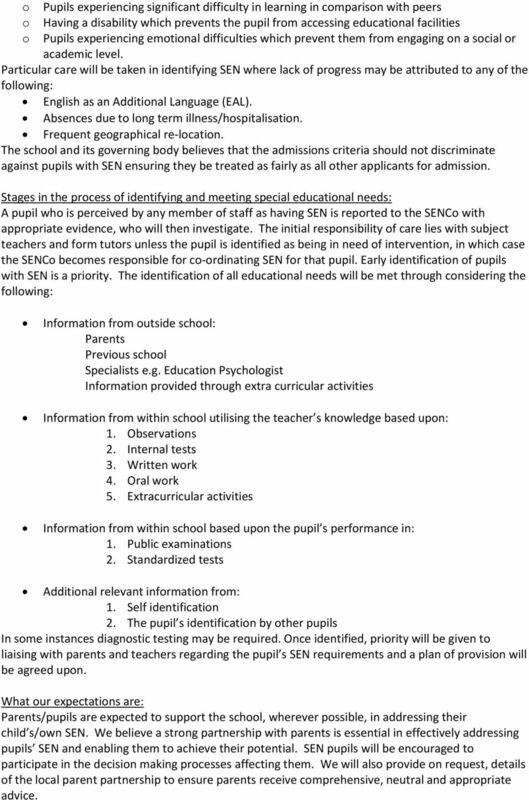 Stages in the process of identifying and meeting special educational needs: A pupil who is perceived by any member of staff as having SEN is reported to the SENCo with appropriate evidence, who will then investigate. The initial responsibility of care lies with subject teachers and form tutors unless the pupil is identified as being in need of intervention, in which case the SENCo becomes responsible for co-ordinating SEN for that pupil. Early identification of pupils with SEN is a priority. The identification of all educational needs will be met through considering the following: Information from outside school: Parents Previous school Specialists e.g. Education Psychologist Information provided through extra curricular activities Information from within school utilising the teacher s knowledge based upon: 1. Observations 2. Internal tests 3. Written work 4. Oral work 5. Extracurricular activities Information from within school based upon the pupil s performance in: 1. Public examinations 2. Standardized tests Additional relevant information from: 1. Self identification 2. The pupil s identification by other pupils In some instances diagnostic testing may be required. Once identified, priority will be given to liaising with parents and teachers regarding the pupil s SEN requirements and a plan of provision will be agreed upon. What our expectations are: Parents/pupils are expected to support the school, wherever possible, in addressing their child s/own SEN. We believe a strong partnership with parents is essential in effectively addressing pupils SEN and enabling them to achieve their potential. SEN pupils will be encouraged to participate in the decision making processes affecting them. We will also provide on request, details of the local parent partnership to ensure parents receive comprehensive, neutral and appropriate advice. 3 Our SEN policy recognises and reinforces the need for teaching that is fully inclusive. The Governing Body will ensure appropriate provision is made for all pupils with SEN. We have adopted a whole school approach whereby pupils with SEN are, as far as is practicable, fully integrated into mainstream classes. The SEN Code of Practice makes it clear that all teachers are teachers of pupils with SEN and are expected to differentiate appropriately for different levels of need. 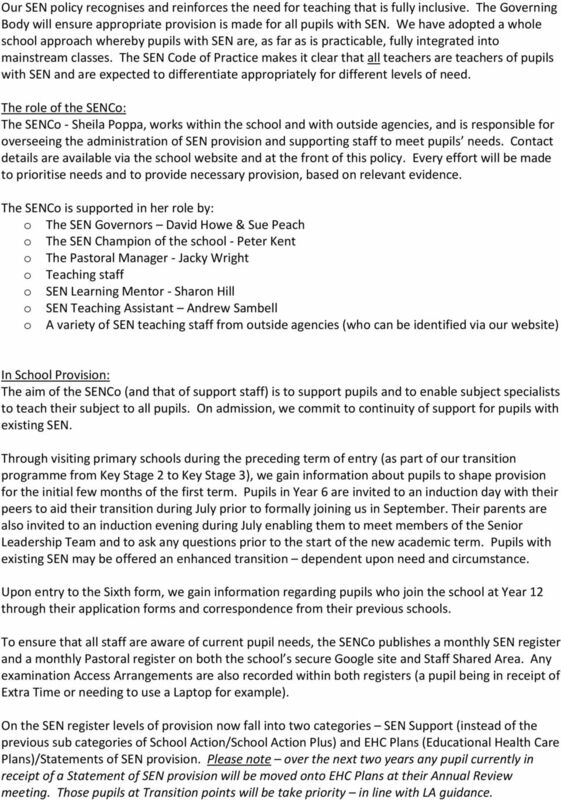 The role of the SENCo: The SENCo - Sheila Poppa, works within the school and with outside agencies, and is responsible for overseeing the administration of SEN provision and supporting staff to meet pupils needs. Contact details are available via the school website and at the front of this policy. Every effort will be made to prioritise needs and to provide necessary provision, based on relevant evidence. The SENCo is supported in her role by: o The SEN Governors David Howe & Sue Peach o The SEN Champion of the school - Peter Kent o The Pastoral Manager - Jacky Wright o Teaching staff o SEN Learning Mentor - Sharon Hill o SEN Teaching Assistant Andrew Sambell o A variety of SEN teaching staff from outside agencies (who can be identified via our website) In School Provision: The aim of the SENCo (and that of support staff) is to support pupils and to enable subject specialists to teach their subject to all pupils. On admission, we commit to continuity of support for pupils with existing SEN. Through visiting primary schools during the preceding term of entry (as part of our transition programme from Key Stage 2 to Key Stage 3), we gain information about pupils to shape provision for the initial few months of the first term. Pupils in Year 6 are invited to an induction day with their peers to aid their transition during July prior to formally joining us in September. Their parents are also invited to an induction evening during July enabling them to meet members of the Senior Leadership Team and to ask any questions prior to the start of the new academic term. Pupils with existing SEN may be offered an enhanced transition dependent upon need and circumstance. Upon entry to the Sixth form, we gain information regarding pupils who join the school at Year 12 through their application forms and correspondence from their previous schools. To ensure that all staff are aware of current pupil needs, the SENCo publishes a monthly SEN register and a monthly Pastoral register on both the school s secure Google site and Staff Shared Area. Any examination Access Arrangements are also recorded within both registers (a pupil being in receipt of Extra Time or needing to use a Laptop for example). On the SEN register levels of provision now fall into two categories SEN Support (instead of the previous sub categories of School Action/School Action Plus) and EHC Plans (Educational Health Care Plans)/Statements of SEN provision. Please note over the next two years any pupil currently in receipt of a Statement of SEN provision will be moved onto EHC Plans at their Annual Review meeting. 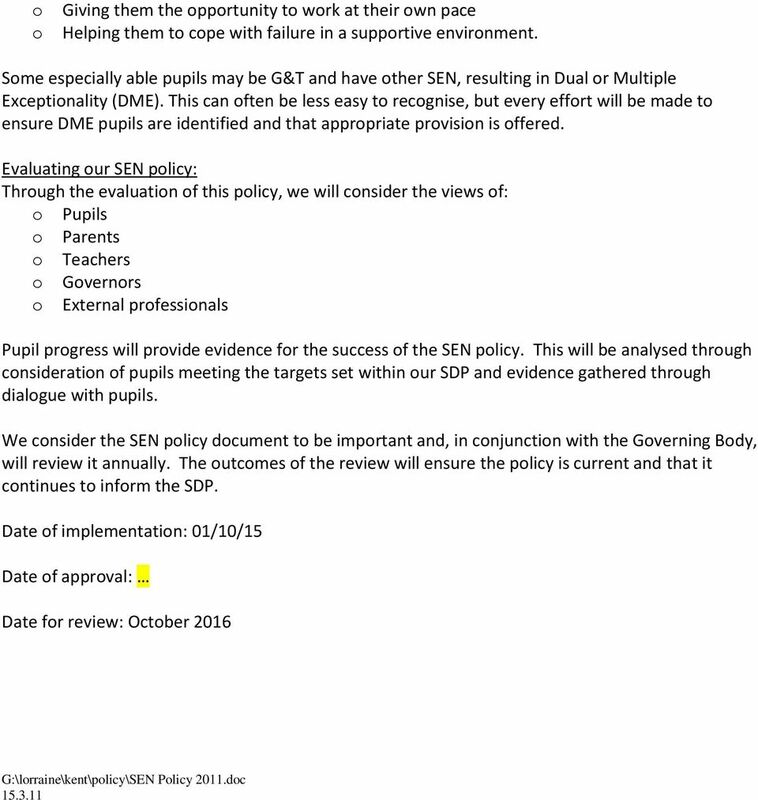 Those pupils at Transition points will be take priority in line with LA guidance. 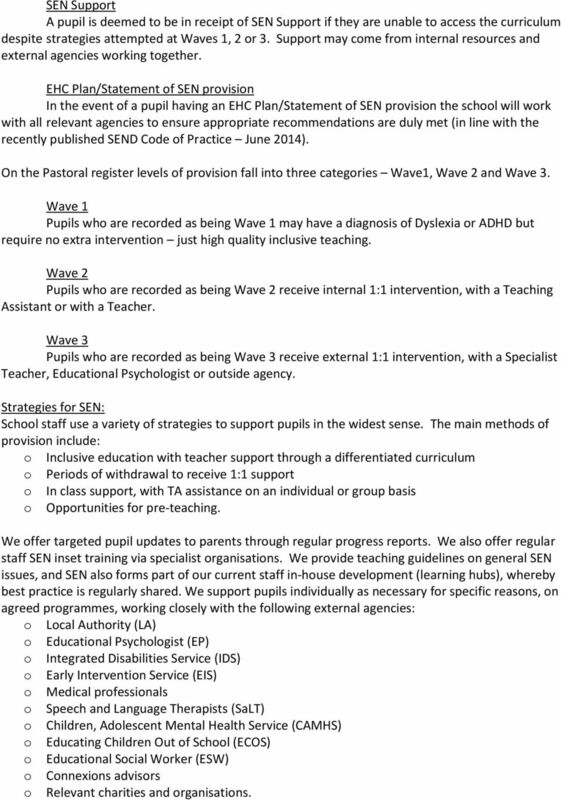 4 SEN Support A pupil is deemed to be in receipt of SEN Support if they are unable to access the curriculum despite strategies attempted at Waves 1, 2 or 3. Support may come from internal resources and external agencies working together. EHC Plan/Statement of SEN provision In the event of a pupil having an EHC Plan/Statement of SEN provision the school will work with all relevant agencies to ensure appropriate recommendations are duly met (in line with the recently published SEND Code of Practice June 2014). On the Pastoral register levels of provision fall into three categories Wave1, Wave 2 and Wave 3. Wave 1 Pupils who are recorded as being Wave 1 may have a diagnosis of Dyslexia or ADHD but require no extra intervention just high quality inclusive teaching. Wave 2 Pupils who are recorded as being Wave 2 receive internal 1:1 intervention, with a Teaching Assistant or with a Teacher. Wave 3 Pupils who are recorded as being Wave 3 receive external 1:1 intervention, with a Specialist Teacher, Educational Psychologist or outside agency. Strategies for SEN: School staff use a variety of strategies to support pupils in the widest sense. The main methods of provision include: o Inclusive education with teacher support through a differentiated curriculum o Periods of withdrawal to receive 1:1 support o In class support, with TA assistance on an individual or group basis o Opportunities for pre-teaching. We offer targeted pupil updates to parents through regular progress reports. We also offer regular staff SEN inset training via specialist organisations. We provide teaching guidelines on general SEN issues, and SEN also forms part of our current staff in-house development (learning hubs), whereby best practice is regularly shared. We support pupils individually as necessary for specific reasons, on agreed programmes, working closely with the following external agencies: o Local Authority (LA) o Educational Psychologist (EP) o Integrated Disabilities Service (IDS) o Early Intervention Service (EIS) o Medical professionals o Speech and Language Therapists (SaLT) o Children, Adolescent Mental Health Service (CAMHS) o Educating Children Out of School (ECOS) o Educational Social Worker (ESW) o Connexions advisors o Relevant charities and organisations. To ensure that all pupils with specific learning difficulties are identified and supported in school. GIFTED & TALENTED POLICY Signed Governor Print Name Date: Review: 1 Able, Gifted and Talented learners are defined as, Those who show outstanding achievement or potential ability in a wide range of contexts. The Chalfonts Community College Special Educational Needs and Disability (SEND) Annual Information Report September 2015. The Chalfonts Community College Special Educational Needs and Disability (SEND) Annual Information Report September 2015. The Chalfonts Community College is a much larger than average sized secondary school. characterised by short-term difficulties in understanding, temporary drop in self-esteem and minor emotional problems. St John Bosco College is a mixed Catholic Comprehensive School in SW19. Meeting the Needs of Pupils with Special Educational Needs and Disabilities. What support to expect for your child? DUBAI COLLEGE. A tradition of quality in education. Special Education Needs & Disability (SEND) Policy. Statement of Intent. Leeds Local Offer: The specialist education offer (2-16) What is the specialist education offer and where has it come from? 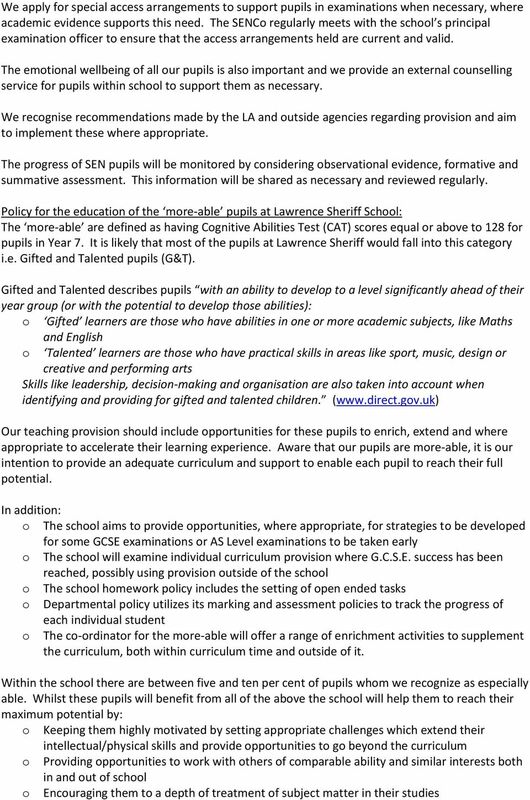 GIFTED AND TALENTED POLICY At St Nicholas CE Primary School we value all children equally and endeavour to ensure that all individuals have the opportunity to achieve their potential, regardless of ability. Idsall School Idsall is a co-education 11-18 comprehensive school. It is a larger than average secondary school with 1300 students.